Rubies form deep beneath the earth’s surface, where molten metals, minerals, and gases are pushed to the surface by cataclysmic events. They seem to defy all natural odds by emerging in bands of marble in some of the highest mountain peaks. It seems ruby formation is a miracle of sorts. Geologists, gemologists, and chemists know what they’re comprised of, and their primary geological locations lend themselves to some educated speculation as to how they form, but their unique properties present a mystery that is, as yet, unsolved. The mystery revolves around the absence of silica and the low amount of iron in their structure. Considering that silica and iron are two of the most copious minerals on Earth, it baffles geologists as to which process would eliminate silica and minimize iron enough for rubies to form. In addition to the absence of these elements, chromium (one of the rarest elements on earth) must find its way into the aluminum crystal grid to lend rubies their brilliant red hues. This is also confounding to geologists. 1. Sasso, Anne. "The Geology of...Rubies." Discover Magazine, November 2004. Accessed May 21, 2012. http://discovermagazine.com/2004/nov/geology-of-rubies. 2. "How are Rubies Formed." Want To Know It. 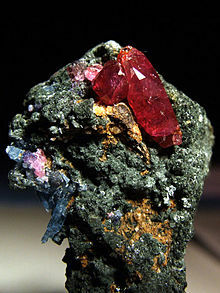 Accessed May 21, 2012. http://wanttoknowit.com/how-are-rubies-formed/.